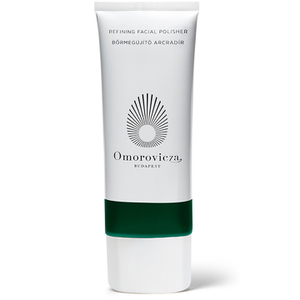 A foaming two-phase peel from Omorovicza, combining a blue copper paste and a lactic acid activator, polishes and smoothes; refining dull skin encouraging collagen production for immediate skin brightness. The skin instantly appears hydrated, rejuvenated and softened. ACTIVATOR; Aqua (Hungarian Thermal Water), Lactic Acid, Hydroxyethylcellulose, Phenoxyethanol, Glycerin, Saccharomyces (Hungarian Thermal Water) Ferment Extract, Ethylhexylglycerin, Pyrus Malus (Apple) Fruit Extract, Chlorella Vulgaris/Lupinus Albus Protein Ferment, Pectin. PASTE; Cetearyl Ethylhexanoate, Sodium Bicarbonate, Glyceryl Stearate, Sodium Cocoyl Glutamate, Stearyl Heptanoate, Squalane, Cera Alba (Beeswax), Cetearyl Alcohol, Copper Gluconate, Camphor, Salvia Officinale (Sage) Oil, Tocopherol, Mannitol, Anthemis Nobilis (Chamomile) Flower Oil, Citronellol, Pelargonium Graveolens (Geranium), Flower Oil, Linalool, Limonene, Geraniol, Yeast Extract.